Renovating any space in your home can be a long, daunting task. You are trying to deciding if renovating is the right choice for your home. At Cabinet Discounters, we can work with you to find the right designs for your home, style, and budget. Our team is comprised of experienced, friendly customer services representative who can work with you every step of the way. Cabinet Discounters has several conveniently located showrooms all over Maryland, Virginia, and Washington, DC. Cabinet Discounters has one of the largest selection of kitchen cabinets with over 1,000 different combinations of wood, color, style, construction, and design. Our team can work with you to determine which typer of design style is right for your needs. A kitchen redesign can add value and beauty to your home. If you are not sure what design is right for you, you can visit one of our showrooms for inspiration. Stop by one of our seven convenient showrooms in Annapolis, Columbia, Gaithersburg, Mt. Airy, Olney, Chantilly or Springfield. If you would like to visit one of our showrooms, request a showroom appointment today for more information. Is Kitchen Renovation Right For You? Does your kitchen match the aesthetic of your home? If your kitchen appears older than the rest of the home, you may want to consider a kitchen redesign. Are you planning to sell your home? A kitchen redesign can add value to your home. Are your appliances outdated? If so, you may want to replace your appliance and consider a complete kitchen redesign to match your new appliances. Do you need help? Consider Cabinet Dsicounetrsto help you with your kitchen redesign projects. We have a wide range of experienced designers to help you plan out your remodeling project. What is your budget? Budget is an important factor to consider when renovating your kitchen. 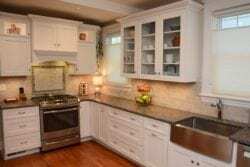 Renovating your kitchen should be within your budget. At Cabinet Discounters, we can work with you to find styles and designs that fit your budget.